As many of you may know, I will not be cooking this Thanksgiving after having had ankle surgery last Monday. It really is not that I was trying to get out of cooking that big messy dinner wonderful holiday and family get together meal, it’s more like I had to get my surgery done before Spring so that I could get back On the Road to visit some more local wineries and farms! In order to get a jump on things, I spent many days before my surgery slaving in a hot kitchen playing make believe and preparing Thanksgiving dishes (well, maybe not all of them…) so that I could write some Thanksgiving posts and give you a few great recipes that I made and loved for your holiday cooking and baking enjoyment. You just knew that I had to be cooking something else with pumpkin. I have enough pumpkins to keep me supplied for years to come! After preparing Pumpkin Muffins with Cream Cheese Frosting, French Pumpkin Soup, Pumpkin Ice Cream, Pumpkin Fall Bites Dog Treats (my guest post at Suddie’s Blog at Deep Acres Farm) and a few other pumpkin surprises to come…the next choice had to be pumpkin pie! This is one ginormous pumpkin! It’s a Candy Roaster. I don’t care for too many pies, but pumpkin pie has to be one of my all time favorites. I only want to eat it between Thanksgiving and Christmas and then I am all done with that, but I can eat a mess of it during that month! I have to say that the good ole’ Libby’s pie made from a can ain’t so bad, but if you want a twist on a pumpkin pie that delivers a real surprising taste, use fresh pumpkin. It has a totally different flavor and Libby just can’t put that in a can. It doesn’t look quite so intimidating on the table! I tried two types of pumpkin in this recipe. Different pumpkins will produce different flavors. 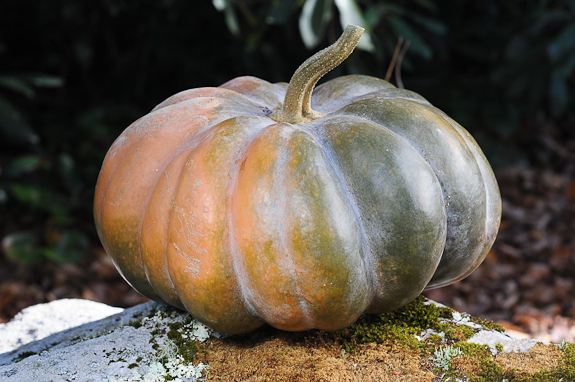 The Fairytale pumpkin has a mild flavor with a deep orange color. I tried to make this pie with a Candy Roaster pumpkin and found that the slightly spicy flavor was not as pleasing as the Fairytale. After a few days in fridge, the Candy Roaster version was good, but who wants to wait a couple of days to allow the flavors to come together. My preferred choice is the Fairytale pumpkin. It had a delightful and pleasing pumpkin taste. The Fairytale pumpkin also produced a filling that was so much smoother and lighter than what you get from canned pumpkin. The only change I would make to the published recipe is to leave out the cardamom. One minute I liked it in the pie and the next I wasn’t so sure, so I say ditch it and save it for another dish. I prefer the taste of this Fairytale pumpkin in the pie. If you aren’t able to find a Fairytale pumpkin, a Sugar Pie pumpkin should work just fine in this recipe. Please, no Jack-O-Lanterns, they don’t have a pleasant taste. Those big orange pumpkins may be fun to carve, but are not very good for cooking. 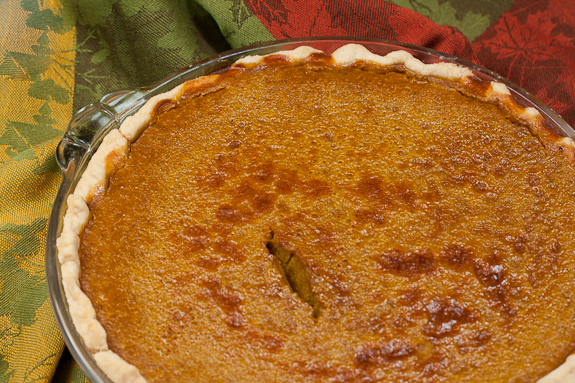 The Sugar Pie pumpkins are smaller to handle and are sweeter in flavor, which makes them perfect for baking. My favorite pie crust recipe is courtesy of Ina Garten. It has just enough butter to have a bit of a buttery taste, but adds shortening to give it that light and flaky texture. The nice thing about a homemade pie crust (besides tasting like 1,000 percent better!) is that they don’t brown as quickly and can stand up to longer cooking times when making pies. So you aren’t stressing, make the crust ahead (it makes enough for two pies) and let it rest in the fridge for a half hour or more. Go about your other turkey business and then come back, roll it out and fill it. How easy is that (to quote Ina)? 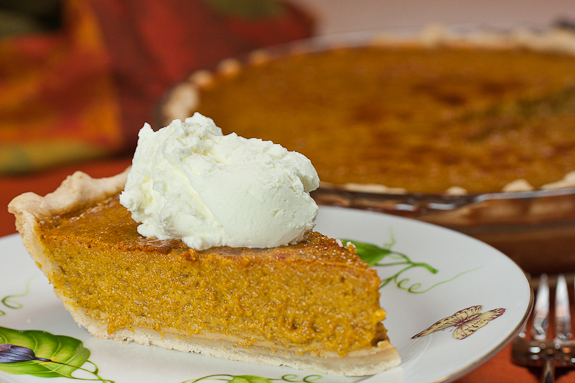 There’s nothing better than homemade pumpkin pie prepared with your own puree! Then top it with Bourbon Whipped Cream! * I suggest you follow the directions for making your own purée here. This will give you the best results and keep the purée from becoming too watery to bake with. * Since there are so many variations on pie pan sizes, I thought I would give you the exact measurements of the one I used to give you the best results. I used a pyrex glass pie dish that measured 8 inches across the bottom, nine and a half inches across the tip and two inches high. Mix the sugars, salt, and spices, and lemon zest in a large bowl. Beat the eggs and add to the bowl. Stir in the pumpkin purée. Stir in cream or evaporated milk. Whisk all together until well incorporated. Pour into pie shell and bake at 425°F for fifteen minutes. After fifteen minutes reduce the temperature to 350°F. Bake forty to fifty minutes, or until a knife inserted near the center comes out clean. Cool on a wire rack for two hours. Serve immediately or let sit overnight in the refrigerator to serve the next day. * Be sure to bring the pie close to room temperature before serving, as the flavors are best then. Serve with Bourbon Whipped Cream. 1. Why are your food photos so unbelievably good? What’s your secret? 2. 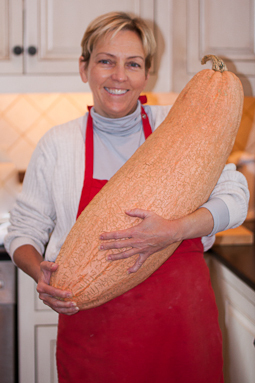 Is that massive thing you’re holding really a pumpkin? 3. The bourbon whipped cream recipe intrigues. I’ve always been hesitant to cook with liquor after I once added too much bourbon to a butternut squash soup recipe, but this whipped cream sounds really good. I’m not a huge pumpkin pie person, but this looks incredible! And the bourbon whipped cream… you just made my tummy grumble. That thing looks like it would make about 26 pies! 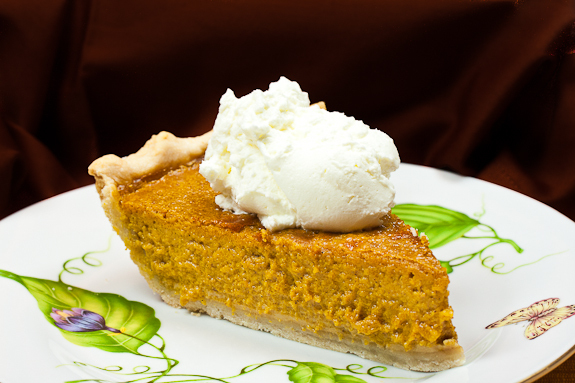 Pumpkin pie for breakfast, with the bourbon whipped cream, of course… and I just love that Fairytale pumpkin photo. You better be resting! that whipped cream recipe is so easy! I can’t wait to try it. I am the same way as you – just get things over with rather than putting it off! Hopefully you will have an smooth and quick recovery because ouch, ankle surgery sounds painful. Beautiful pumpkin cake though! I could surely go for a slice… or two… of it. Yum. Thank you Roxan. I hope everything heals up quickly. I am ready to have my ankle (and my shoes!!) back. Bourbon whipped cream goes well with all sorts of pies, I agree. It is perfect to serve during the holidays. Yes, there was way too much pie leftover since I made a few the day before my surgery. Now I will certainly need a major rehab/exercise program! The fresh pumpkin makes a world of difference in baking. I am a total convert now. You are so precious to bake these in advance so that we would have such lovely Thanksgiving inspiration. I love how you used your own pumpkins in these past few recipes. Just splendid! This pie looks spectacular, and I’m so eager to try that whipped cream. Thank you for sharing. I hope you have a wonderful evening! It has been fun to try out all of the different pumpkins this year. They really have been very good in all of the dishes/baked goods I have made. Thank you for the comment, Patty. 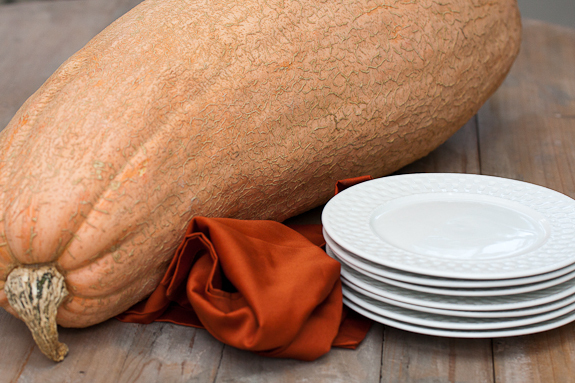 Be prepared for lots of puree when you crack open one of these big pumpkins! I still have a few to go, so I guess I will be delivering pumpkin puree to the neighbors pretty soon! There is no way on Earth I will ever use it all, but it’s been fun trying the various heirloom varieties. I’ve never had pumpkin pie but I do love the sound of that boozy whipped cream 😉 Hope your ankle doesn’t keep you down for too long! Boozy whipped cream is always a nice addition to pie. 🙂 I hope the ankle doesn’t keep me down and out for too long either. Thanks! I knew you would be back in action!! you do find some interesting pumpkins!! I found one of those french pumpkins, its been sitting on my counter staring at me….sigh…and I saw those fairy tale pumpkins in an Asian supermarket, they were so cool looking! Thank you so much for all the inspiration! I stockpiled the posts as there isn’t much other than sofa action going on at my place right now! I hope to be up a bit by the 1st of December after my cast is off and I go back into a boot. Major glam factor (NOT!). On a side note — are you going to FoodBlogger Camp in January?? Thanks for the comment. Opening it up and cooking the pumpkin scared me! What am I ever going to do with all of it? Yikes! You could kill someone with that pumpkin! You could also kill someone with that pumpkin pie, if you put a shark infested moat inbetween them and a slice of it. I think I’d take my chances with the sharks to try and get a taste. LOL! You are too funny. 🙂 That was ONE heavy pumpkin! We forgot to weigh the darn thing. I know I wasn’t hauling it upstairs to put it on the scale! I love that everyone seems to be ‘sneaking’ bourbon into their fall recipes. It pairs so well with those deep/rich flavors. I’ll take an extra 2 (ok 3) dollops of that whipped cream please. That fairytale pumpkin is BEAUTIFUL! I don’t have access to any, but we are dressing the house in all sorts of gourds, and we’re inspired, we crack open one or two for soup. thanks for this article very nice information really useful. We had alot of satisfaction growing Musquee de Provence, “Fairytale” Pumpkins this past season. Makes an amazing soup and a great pie. We even used pumpkin for a casserole, substituting pumpkin for sweet potatoes. Sometimes we substitue bourbon for vanilla…and that is pleasing. As for your bourbon whipped cream, don’t forget that for Derby Day! We put it on top of that “trademarked” pie! Heavenly!